What happens when an epic storm system ruins your plans of gallivanting around plantations like a Southern Belle, er, Midwesterner? And your husband says, “Well, is there anything to the west of us? Anything we could go see?” And then he hears the two words that men (and women) around the world find as sweet nothings… TABASCO SAUCE? Our morning started with a tornado warning and a panic-stricken wife (ME! ), but Mr. Yoder Toter ended his day in the pure bliss of taste-testing TABASCO goodness. 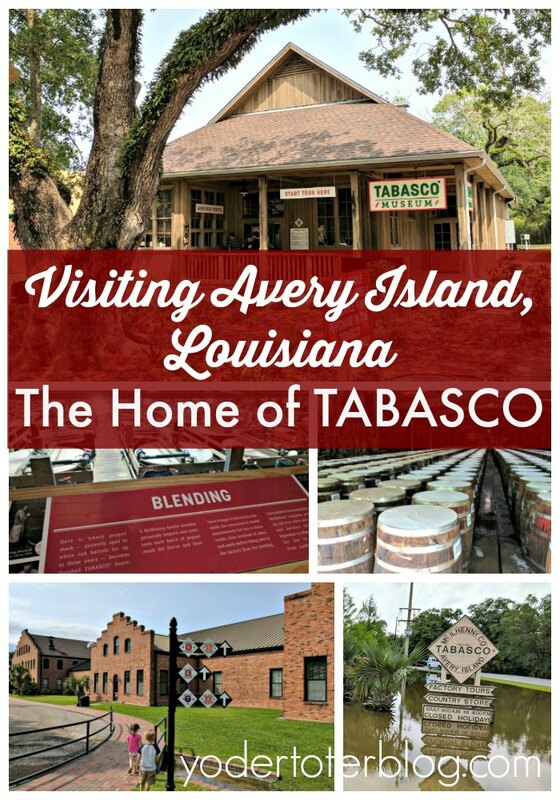 Not one moment before that sad morning at a hotel in Gonzales, LA, did we even know that the home of TABASCO was in the low-lying lands of Avery Island, Louisiana. We traveled (through the flood waters) and we conquered. Avery Island is approximately 140 miles west of New Orleans. Surrounded by marsh, Avery Island is not actually an island- it’s a salt dome! However, arriving over a flooded waterway sure made it feel like one. The company has not relocated since the original red TABASCO was created here in the late 1860s by Edmund McIlhenny. 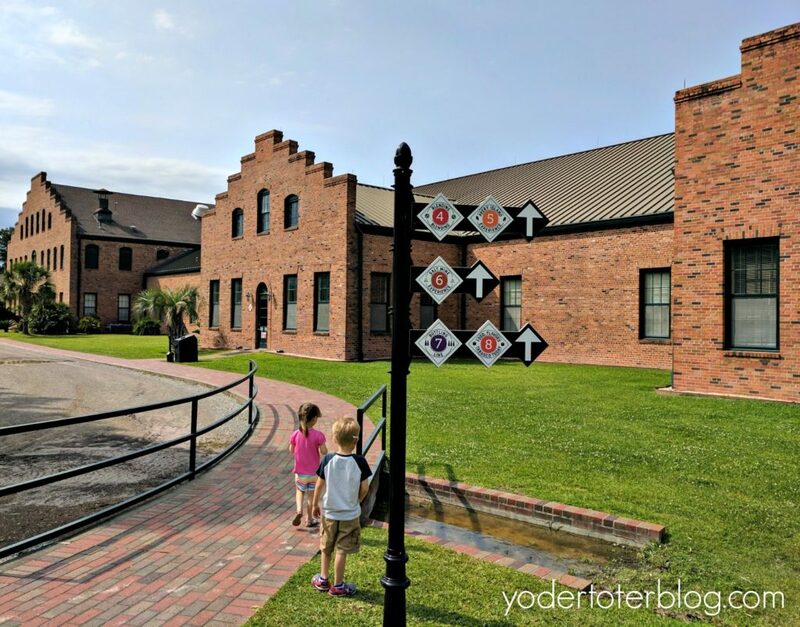 Once pulling into the Tabasco homestead, you’ll feel like you’ve been transported back in time 100 years, as the buildings & trees add to the feeling of the old south. 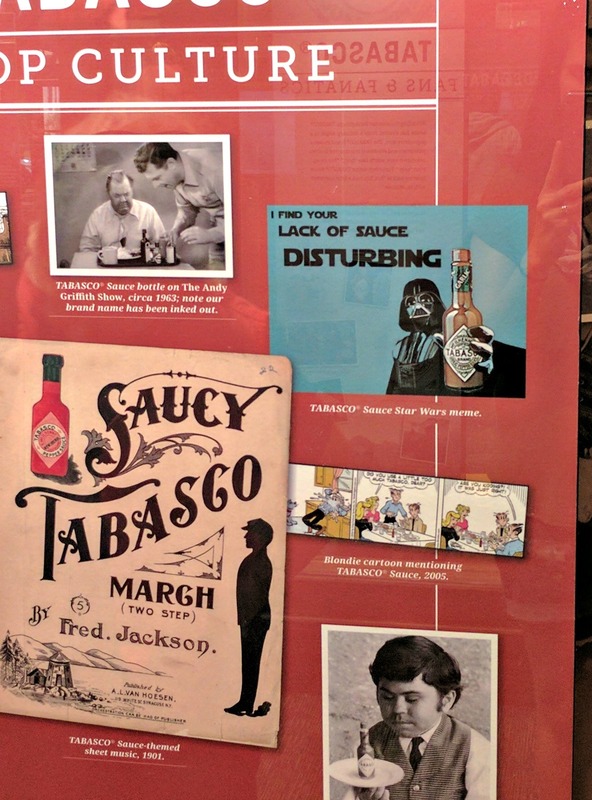 Admission to the TABASCO Museum & Factory on Avery Island is very affordable! I believe we paid $5.50 for four of us, our youngest was free. Very few times can you experience something as a family of 5 for under $25. After visiting the Museum, take a self-guided tour through the grounds, easily followed by numbered signs. The most interesting for my husband and myself was the barrel house. The peppers are turned into mash and placed in white oak barrels and aged for THREE YEARS. 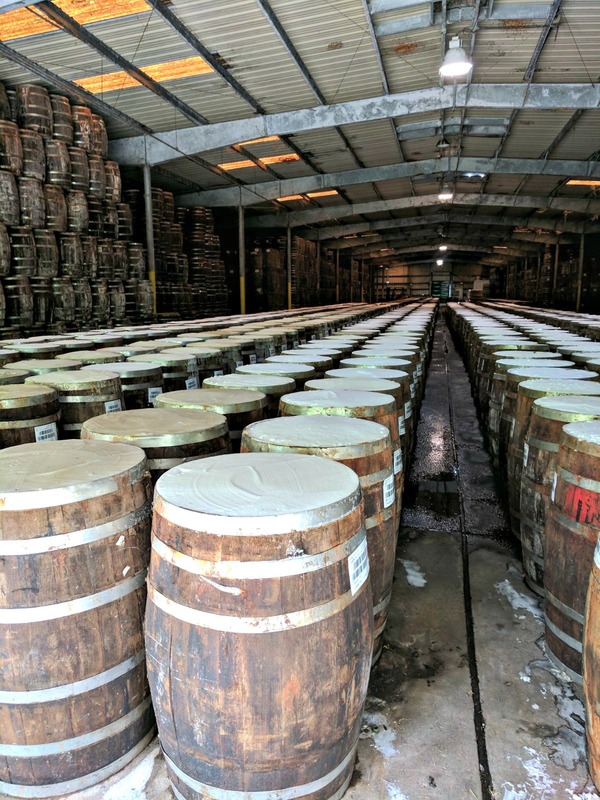 Seeing so many barrels of pepper mash just waiting to be turned into sauce, showed the great quantity of Tabasco that is produced in this small town. Unfortunately, because we visited on a Sunday, we were unable to see the factory in motion. The bottling line is only open Monday-Thursday, so plan your visit to Avery Island accordingly. 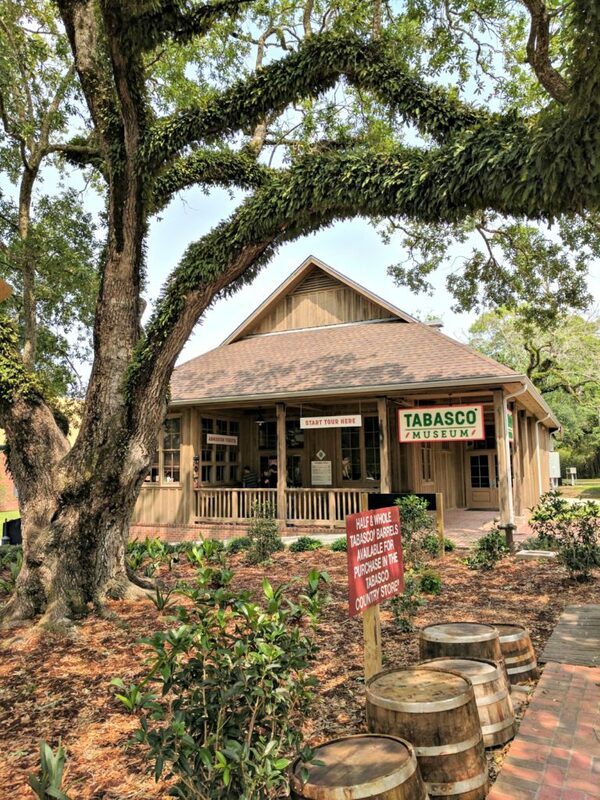 The best part of the Avery Island tour was the TABASCO Country Store! Tabasco ice cream! Tabasco suckers! Tabasco coffee mugs ! (Said just like Yogurt from Spaceballs, lol). I was intrigued by just how many things can be flavored using a few hot peppers, and my husband liked taste-tasting all of the many different sauces. We only wished we weren’t traveling home by air, as the products are priced reasonably. Don’t worry though- we brought home a bottle of Mr. YT’s favorite- wrapped within the kids (deflated) pool floaties! No clothes were injured in this attempt. We had our double stroller (side by side) with us, but we may not have needed it since our kids are a bit older. If you do take a stroller, try to take a single because the doorways and hallways are a little tight. The closest town with numerous lodging possibilities would be Lafayette, LA. I usually recommend the Homewood Suites or the Fairfield Inn and Suites. You can check Current Rates HERE. Plan on spending 2 hours on JUST Avery Island and the TABASCO tour. If you wish to tour the adjacent Jungle Gardens, I’d add even more time. We could not visit Jungle Gardens due to flooding. So tell me, do you love TABASCO products? Ever had spicy ice cream?